A short novella that happens between the Goddess Test and the recently released Goddess Interrupted. Presenting Goddess Test #1.5 The Goddess Test by Aimee Carter. This starts off after the first book The Goddess test finishes. As agreed between Kate and Henry(Hades), after the council passed her and they got married, she gets to live on the sunny side up, aka the surface world for every 6 months like his previous wife Persephone did. So it is that time of the year and Kate is spending her first 6 months after marriage with James(Hermes) touring Greece. Where they come upon Pollux and Castor(the Gemini twins) running from Zeus and Hades(Walter and Henry now) for centuries. As novellas go this is a very short and very interesting side-story. Both The Goddess Test and Goddess Interrupted had the story told from Kate's Point of view but here it is done very differently sections are divided meaning every character gets their own chapter but the main showstopper here is the legends and the myths of ancient Greek in play here. Aimee Carter has done as great job molding age-old myths and giving them a modern look while still retaining its mysticism. So excited for what the other novella The Goddess Legacy and the final book of the series The Goddess Inheritance have to offer. 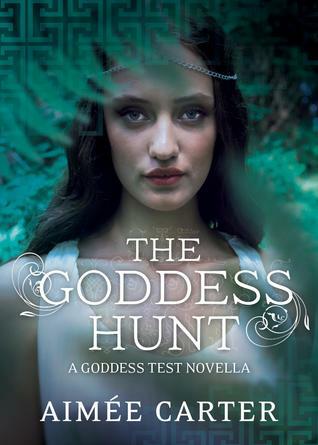 "A great edition to the Goddess Test saga"
I'm finding that Aimee Carter really has a gift for writing. I love this series and I'm going to have to check this out!